My favorite dish my Wai Po made for us was her wok fried pomfret with scallions and ginger. 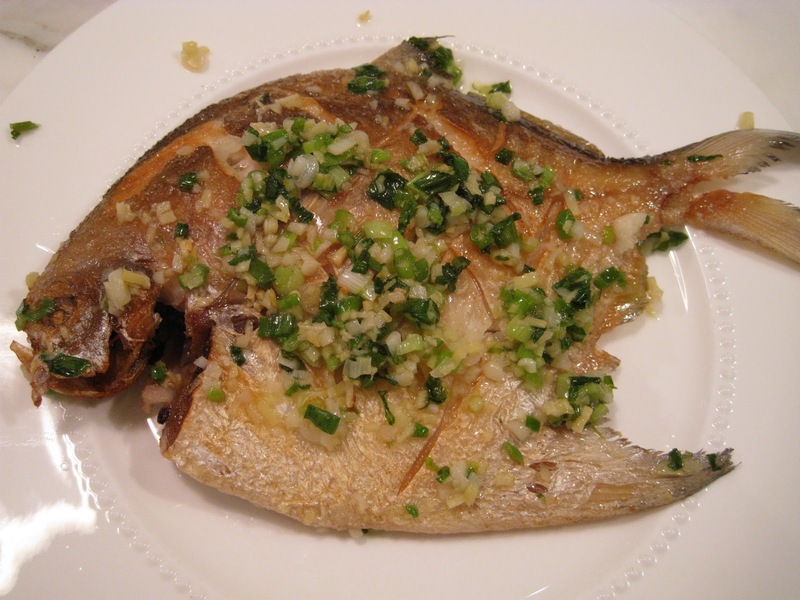 The white pomfret is not a fish you will find in a western market. I met up with my mom yesterday to have lunch and do a little grocery shopping at the Ranch 99 Market up in Lynnwood. They have quite the large variety of whole fish, among aisles and aisles of other Asian foods. My Wai Po would have bought her fish from a vendor on a street market in Taipei. And so I had no idea what fish she had used. But with mom by my side, I had with me as close of a source of that information as I could get. I bought the fish, I got the recipe, I am all set to go. My last words to my mom were, I hope I don't mess this up. Make several cross slits on both sides of the pomfret. Drizzle with rice wine, making sure it evenly coats the fish. Sprinkle with salt. Cover and refrigerate. When ready to cook, dry the fish with paper towels. In a well seasoned wok, or non stick fry pan, heat three tablespoons of grape seed oil over medium-ish heat. Gently place the fish in the wok and fry until cooked through. My mom advised not turning the heat up too high as you want to slowly fry the pomfret so it does not burn or char the skin. Flip the fish over once to fry both sides. She also suggested the non stick pan as the skin does not stick to the pan. When the fish is cooked, drain on paper towels. Heat 1 tbsp oil in a wok, add scallions, ginger and garlic and fry until fragrant. Add in the sugar, vinegar, salt and toss to incorporate. Carefully place the fish into the wok to coat with the sauce. The fish was delicious, though I have to say, Wai Po made it better.